Despite, that friends love each other sometimes they furiously compete. 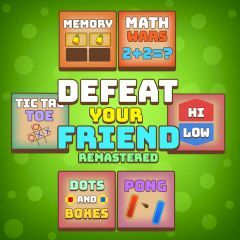 In this game you can have fun playing six different games for two players. Each game has its own interface, but the goal is similar to all. Get five points first and win the game. Repeat it again or select another one to have more fun. Learn controls for your player and watch the screen patiently.